"I used to think the Bush hawks suffered from testosterone poisoning, always throwing sharp elbows and cartoonishly chesty my-way-or-the-highway talk around the world, when a less belligerent tone would be classier and more effective. "But now we have the spectacle of the 70-year-old Rummy acting like a 16-year-old Heather, vixen-slapping those lower in the global hierarchy, trying to dominate and silence the beta countries with less money and fewer designer weapons." What is happening is that evolutionary psychology is slowly creeping into the American cognitive process. Here, she is mentioning Alpha and Beta personas, and hierarchies. Get ready people. Major changes for the better are coming, and they should be felt within the next 20 to 50 years. ......or maybe sooner.....or maybe later....but they are coming. Mike Feeley's ads began appearing on television. So, far, Mike's opponent, Bob Beaubrez (pronounced, Bo-Pray) is taking a civil tone in his own television commercials, but their have been verbal swings in the two debates that have been held. Notebook entry, September 21, 2002. 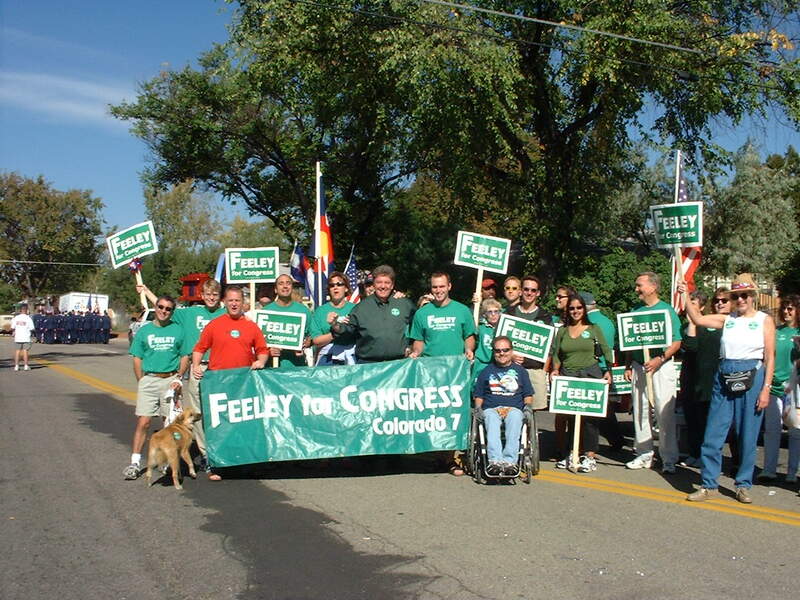 I had a rare Saturday off and spent the morning marching in the "Gateway to Aurora" parade with 7th District Congressional candidate Mike Feeley. Here is a group photograph just before the start of the parade Notice that the amount of eligible voters has increased somewhat as compared with the first parade. See notebook entry, May 27, 2002. My wife Diana is just above the gentleman in the wheelchair. Busy, busy, busy. I just finished revising the essay/rebuttal to The Denver Post editorial of Sept, 2001 on Slave Reparations. This time, I put my emotions in the background and began to put some science behind the work. But the important thing that I want you to note is that the references at the bottom are linked to Amazon.com. I don't know if this will catch on, but I sense that it will. It gives common people access in other areas of the world the ability to purchase the works noted in the essay to confirm their own studies. Hopefully, at the other end, there would be financing available to purchase the books. Any billionaires out there want to contribute to an Amazon.com book purchase plan for the needy? The updated and revised essay rebuttal can be read at: Slave Reparations Anyone? A Reply.